The Protestant Church of Ireland’s newspaper, the Church of Ireland Gazette started life as a monthly magazine, named The Irish Ecclesiastical Gazette, became a weekly in 1880 and changed its name to The Church of Ireland Gazette in 1900 and is still in publication. The Church of Ireland's record repository, the Representative Church Body Library has the only complete hard-copy run of this newspaper and has digitised all editions for the 70-year period between 1856 and the end of 1923 and it’s available in their archive. You don’t need to have Church of Ireland ancestors or even Irish ancestors to find the Gazette useful as the paper carried pieces about major national and international issues as well as appointments, retirements and general articles. A picture is worth a thousand words is an often used saying. There’s no doubting the attraction of pictures, particularly historical views of towns and landscapes for family history, so that we can see what our ancestors’ surroundings looked like in their own times. We’ve received a book for review, the A R Edwards - Photographic Archive, published by Selkirk Regeneration Co.
Andrew Edwards was born on 30 December 1847 at Badminton, Gloucestershire, the son of Mathew Edwards and Agnes Campbell. He worked for Blackwoods, Edinburgh as a compositor before moving on to work as a photographer for the Wilson Photographic Co, Aberdeen. In 1879, he opened his own studio in Selkirk. He died in 1891. His son, Robert (1877-1965) eventually took over his father’s business. The book is a collection of over 400, largely unpublished, mono landscape photographs of Selkirk, the Selkirk Common Ridings, the Ettrick and Yarrow valleys, the Haining, Bowhill, St Mary’s Loch, Philiphaugh, various towns and villages around the Borders and as far east as Berwick, Coldingham and Eyemouth, some famous Borderers and of the Edwards family. 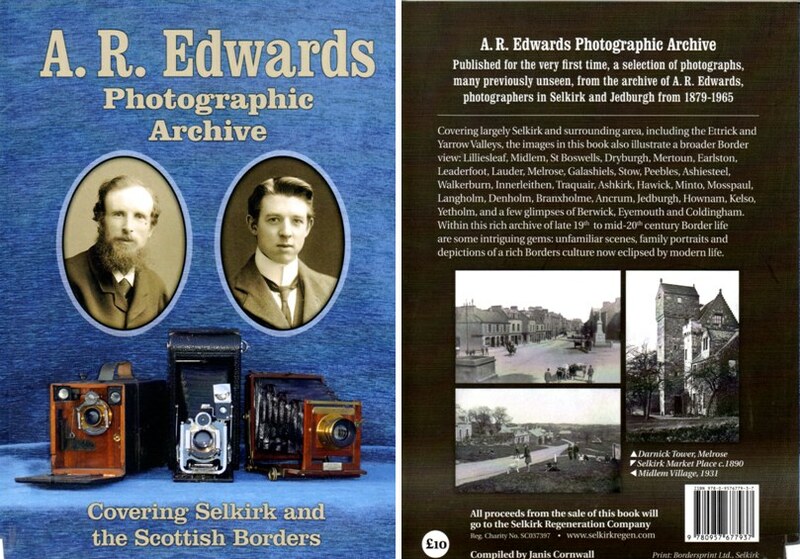 There are short biographies of Andrew and Robert Edwards and colour photographs of some of the cameras used. The front cover of this 252 page paperback shows photos of Andrew and Robert Edwards and 3 cameras. This £10 book is a treasure for everyone in the Borders, especially so, for those living in Selkirk or with a Selkirk connection. Every bed and breakfast and hotel in and around the Scottish Borders and North Northumberland should get a copy for their guests, too.